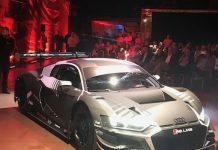 Automobili Lamborghini has presented the new Lamborghini Huracán GT3, in a world premiere at its headquarters in Sant’Agata Bolognese. The unveiling ceremony was carried out in the presence of media, customers and partners from around the world. The GT3 competitor makes its debut following that of the new Huracán LP 620-2 Super Trofeo, which will be the protagonist of the Lamborghini Blancpain Super Trofeo in Europe, Asia and North America from this year. Starting in 2015, the Huracán GT3 will line up in the Blancpain Endurance Series that runs over five venues in Europe, among which is included the famous Spa-Francorchamps 24-hours race. “We are proud to be the partner of Automobili Lamborghini as one of the world’s most prestigious super sports car marques. This cooperation confirms PERTAMINA’s position as the technology partner of Lamborghini Squadra Corse, connected to our vision of becoming a World Class Energy Company with the mission to expand our market globally,” said Ahmad Bambang, Marketing Director of PERTAMINA. The Lamborghini Huracán GT3 is equipped with an Alu-Carbon chassis and a fully integrated FIA-compliant roll-cage. The subframe has been modified both at the front and rear to accommodate a high performance water radiator (front), and for a better positioning of the gearbox (rear), improving aerodynamics.The kerb weight is 1239 Kg with a 42/58 front/rear weight distribution. The final weight will be set by the FIA BOP. As for the Huracán Super Trofeo, the GT3 is equipped with new bodywork fast- fittings and equipped with a new, enhanced-performing engine and gearbox oil cooler. Special attention has been given to safety, with the new Lamborghini Huracán GT3 equipped with a carbon frame 8862 specification seat; an OMP fire extinguishing system; and an innovative roof hatch which enables, in case of need, quick assistance by medical personnel through the roof of the car. Seat belts are provided by OMP, the fuel tank is an FT3 type and the pedals are adjustable. Front and rear lights are LED. The new multifunction steering wheel has been re-engineered along with OMP. The braking system is made up by 380 x 34 mm steel discs at the front (6 pot), and 355 x 32mm steel discs at the back (4 pot), according to FIA regulations, equipped with Bosch ABS. This system features 12 different settings that can be actioned directly from the steering wheel, as can traction control. The tyre sizes are 315/680 at the front and 325/705 at the back. The car is equipped with a pneumatic lifting system. In Europe, the Huracán GT3 is priced at 369,000 Euro (excluding taxes) ex works. Grasser Racing Team will line up two new Huracán GT3s in the 2015 Blancpain Endurance Series. The Austrian team – 2013 Blancpain Sprint Series Pro-Am Champion and third in the 2014 Pro Class – will field the two official test drivers of Lamborghini Squadra Corse: Fabio Babini (ITA) and Adrian Zaugg (RSA) now promoted to factory drivers, and the Italian Mirko Bortolotti who impressed in the 2014 Lamborghini Blancpain Super Trofeo Europe. Working alongside them will be three young talents from Lamborghini’s Young Drivers Program: Giovanni Venturini (ITA), Jeroen Mul (NED) and Andrew Palmer (USA). All three have been promoted to the Lamborghini Squadra Corse GT3 Junior Team. 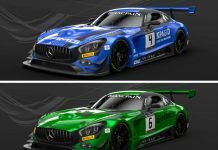 This new program features a step up from the Young Drivers Program, with the aim of selecting the best talents to be involved in testing sessions and GT3 racing. The Italian Edoardo Piscopo and the Serbian Milos Pavlovic have also been promoted to official test drivers for Lamborghini Squadra Corse. 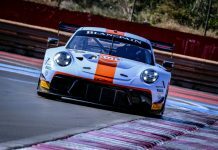 Winners of both the 2014 PRO Class in the European Lamborghini Blancpain Super Trofeo and the World Final, they will be in charge of the GT3 car’s development across the world.